Towering above many other roller coasters is the Top Thrill Dragster. The ride is an unbelievable 420 feet tall, and was the tallest roller coaster and fastest roller coaster on earth when it opened in 2003. Top Thrill reaches the speed of 120 mph in just four seconds! Top Thrill is made up of one hill. Passengers can choose to sit facing forward or backwards on the ride. As Passenger cars venture up the hill they twist in spirals. The Top Thrill is an experience to say the least. On Cedar Point's website it has the top rating of aggressive thrill. But there is more than just height and speed behind this 25 million dollar roller coaster. The coaster harnesses the power of 32 hydraulic engines, 16 on each side of the coaster. The coaster also demonstrates numerous energy changes in only 17 seconds. 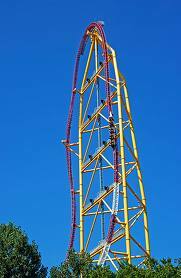 The Top Thrill Dragster is powered by a hydraulic launch system, but what does hydraulic even mean? 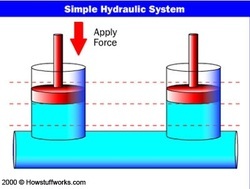 Hydraulics uses a chamber full of a liquid, usually some type of oil and two or more pistons on either side of the chamber. In the diagram on the right the teal is oil inside of a chamber and the red circular things are pistons. To get energy from this simple looking machine force is applied to one of the pistons. The oil cannot be compressed so the pressure from the piston causes the other piston to move upward. This movement from the pistons is what is used to power the machine. 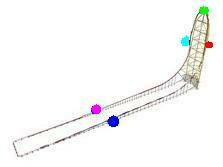 In the case of this roller coaster the energy is used to launch the coaster at 120 mph. This is an image of one of the 32 hydraulic engines used to power the Top Thrill Dragster. 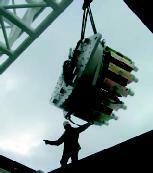 The hydraulic power from all of these motors is transferred to a large cable drum. The energy is then transferred to a cable that is connected to the bottom of the sled that pulls the passenger cars up the 420 foot hill. What is unique about this roller coaster is that it doesn't always make it up the 420 foot hill, in fact it is very common for the train to roll back because all of the kinetic mechanical energy that the train received from the launch has transformed into potential gravitational energy before it has reached the top of the hill. This happens because the power behind each launch is determined by the average speeds of the past three launches. So if the past three rides are only half full of passengers and the next ride is completely full then it is likely that the train will not be launched with enough energy to make it over the 420 foot hill. In this case the roller coaster just rolls back to the start and is launched again using more energy. Through the short 17 second ride on the Top Thrill Dragster there are 5 main areas where energy transformations take place. The dark blue dot symbolizes the moment when the passenger car is launched. Here the coaster has 100% kinetic energy mechanical because it is moving and has no height. At the red dot when the train is about half way up the hill the cart has about 45% kinetic energy mechanical and about 45% potential energy gravitational. About 10% of the energy has left the system as kinetic energy sound and kinetic energy thermal. The next dot, the green dot, is when the roller coaster is at the very top of the 420 foot hill. Here the passenger car will stop for a split second. This is because all the energy left in the system is now potential gravitational energy, which means the coaster has no motion energy. Here there is about 75% potential gravitational energy, about 25% of the total energy as now left the system. Next is the light blue dot, which is half way down the hill. Here there is about 30% kinetic energy mechanical and 30% potential energy gravitational, about 40% of the energy has left the system. Last is the pink dot. This is at the point where the cart has come to a stop. There is no energy within the system anymore. All Energy has left as Kinetic sound, kinetic thermal, and kinetic mechanical in the form of vibrations transferred to the track and breaks. All of these energy transformations happen in only 17 seconds! Hold on Tight and Take a Virtual Ride of Top Thrill Dragster!!! How Well do you Know the Top Thrill Dragster?